After five months in hospital I am finally home, having been discharged on February 14th – Happy Valentine’s Day to Linda and I! It’s great to be home – I can finally watch my soccer “football” matches and, more importantly, be with my amazing wife, Linda – LIFE IS GOOD!! Unfortunately, I came home with six pieces of equipment which are all designed to clear up the congestion in my lungs. The bad news is that it takes FOUR hours out of my day to use all the equipment; the good news is this should only be necessary on a temporary basis. Once I receive the “all clear” from my Pulmonary doctor I will be able to get off the oxygen, high humidity and finally have both the trach and feeding tube removed. The feeding tube isn’t being used any longer as even though I have been eating food by mouth for two weeks now as they want to keep it in as a precaution. The pressure ulcer on my tailbone, acquired while in hospital, will take time to heal. Until then, I’m stuck in my bed. Since my strength was sapped during my long hospital stay and with the FOUR bouts of pneumonia, it will take a few months to gain it back. We are working on reinstating the home-based physical and occupational therapy as soon as possible because exercise, even while lying in bed, will prove beneficial. Due to a hiring freeze and cut-backs at the company Linda worked for, she lost her job at the end of January. Never one to remain idle, she’s been busy applying for several positions and has two offers in hand with a third offer expected early next week. She’ll need to weigh her options carefully as she wants to find a company that will be flexible and compassionate when it comes to having to take time off to attend to my healthcare needs. The packages she’s being offered aren’t what she’s used to, but it is what it is… In the meantime, Linda’s been glad for the opportunity to get the house ready for my return and to spend time with me getting used to all the new equipment and medications I need right now. We’ve hired a new caregiver for me. She’ll be here eight hours a day Monday-Friday while Linda is at work. Finally, although I’ve received many cards and emails conveying what an inspiration I am, it is YOU, my fan base, who have been an inspiration to me and I thank you from the bottom of my heart for your continued love and support. My DVD contains THREE full-length productions; each over 40 minutes in duration. 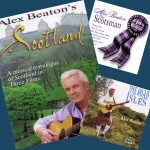 They are a musical, historical travelogue of Scotland with 10 songs each. Originally selling for $25 each in VHS format, they were combined into 1 DVD now selling for $20. There are several songs that are not on my CDs and CAN ONLY BE HEARD ON MY VIDEOS. Along with my DVD, I am also offering two CDs, “The Scotsman” and “The Road To The Isles” for 50% of their purchase price. “The Scotsman” CD features the title song about the drunken Scotsman and the two inquisitive ladies wondering what he wears under his kilt! “The Road To The Isles” features a wonderful selection of songs and the fine fiddle playing of Alasdair Fraser and Robin Lorentz. All three items are available for only $30.00 plus shipping & handling (a $45 value). Proceeds from the sale go 100% towards my rehabilitation and care-giving expenses. There are 19 comments . Miss you at the Estes Park Highland Games. Think of you every day and have you on my prayer list. Be strong and keep the faith! We miss you at Batesville! SO glad you are going home. Being stuck in the hospital is so bad. Glad you are going to get to watch your football again. You have a lot to catch up on! I understand Neal and Ann will be seeing you on their way home. I have been enchanted with your music since I saw you perform at a Scottish/Irish festival in Vallejo, California many, many years ago. Your music makes my heart glad. I had no idea you were going through such a difficult time. Sending my prayers and best wishes. You have been such a positive influence in my life. God bless you. Alex … it is so good to hear you are home, mate, keep up the spirit and remember what you must obviously know … all healing starts in the mind (and Prayer) first. We Pray for you often. Blessings to you and Linda! Linda, you and Alex are truly the most perfect incarnation of what Valentine’s Day’s true meaning should be. You are such an inspiration and an example of beauty and grace in a world woefully lacking in both. Thank you. Southern California -watching the ‘Miracle on Ice’-seems like several lifetimes ago. I keep a good thought and a prayer for you every day, my friend. So glad that things are improving. I have faith they will continue to do so. All the best to you and your wife. As we get ready for this weekend’s Scottish festival at Lyon College in Batesville, I’ve been thinking of how much I miss my favorite part of the festival … Alex Beaton. I’m writing about the festival – and you – on my blog today. Even though folks won’t be able to see you perform live, maybe they’ll visit here and buy a recording. They need to hear your beautiful music! All the best to you as you continue your journey. Much love to you and Linda and prayers for your continuing recovery. Dear Alex–such wonderful news from you and Linda –my daughter and I remember you as the true spirit of Grandfather Mountain, with your voice ringing out over the meadows. We are so glad for this bulletin on your improved health. Today I spent hours of memories downloading my favorite songs from nearly all of your albums. Most of these songs I’ve heard live when you entertained at the Highland Games in Costa Mesa, CA. At one of these events I lost my kilt pin that held my birthstone — an amethyst (Feb. 24). I was tracing my steps and stopped at your booth; you had found my pin and it has had especial meaning to me ever since. I think of you often, and pray that you are continuing to do well in your recovery. Your spirit and voice have blessed the world, and have certainly enriched my life. Love and prayers, Melodee. Think of you both often and check every few days for new update. I am trusting that “no news is good news”, and sending wishes for peace, strength, and grace as your health improves.